Frugal Gardeners are found world-wide and we constantly search for money-saving ways to stretch our garden budget. This Saturday feature will spotlight projects gardeners can create for inexpensive garden art and gifts. We hope our projects will inspire you to become a Frugal Gardener too! Everyone loves unusual containers but custom cachepots can be expensive. Sometimes you're just looking for something out of the ordinary, or you need a specific color to match a room's décor. There's any number of reasons for coloring outside the lines when it comes to unique flowerpots. If you live in a rural area, sometimes there aren't many choices and it is up to you to get creative. 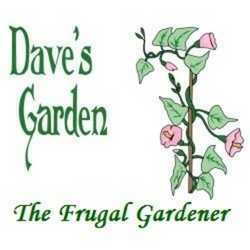 We've done several Frugal Gardener projects and you can read them at this link. My niece, Cassidy is home for her summer break from college and of course, everything she does needs to be as frugal as possible. We've created some unique containers in the past and she was searching for another project to add to her growing collection. We decided to take plain terracotta pots and transform them with nail polish and water. I needed another container for my remodeled laundry room and she wanted a container for a gift. This craft worked out well for both of us. We were quite pleased with the results and it was a fairly easy project. Older teens could do this with no problem and even 'tweens' with proper supervision should get great results. All you need are containers, plastic, terracotta, metal, anything that nail polish will adhere to and a container deep enough to dunk them in. We did keep paper towels handy and Cassidy used disposable gloves to keep the mess off of her hands. Almost any household where girls live probably has an assortment of nail polish. I had to purchase mine, but the up-side was that I was able to co-ordinate the colors! I'm using teal and yellow to match my room and Cassidy has her favorite purple and green. Be sure to wear disposable gloves. This is a messy craft and nail polish can be a pain to remove. Keep paper towels handy in case of drips and spills. Cassidy is using a natural terracotta pot, so along with her green and purple, she adds a little white to help with contrast. There was a small learning curve with this craft. Initially, we added too much nail polish to the water and when we dipped the pot, some of it adhered with lumps. Less is more in this case. Cassidy's pot is covered in the nail polish swirls and we thought it looked quite nice! She created a matching saucer for her pot and we also learned that warm water is better than cold water since the polish stays fluid for a longer period of time. Sometimes it is necessary to dip your container several times to achieve the desired result, but once the polish has adhered to your pot, it won't float away. Clean-up is easy when you want to change colors. Just take a paper towel and wipe the nail polish off the surface of the water. It sticks to the paper towel, just like it did for the flowerpot, so you can clean the surface of the water, add a different color and go again. Now that we had a bit of experience, we started working on my laundry room pot. I painted my pot white to match the other ones already in the room and chose the yellow and light green to co-ordinate. A thinner layer of paint and careful turning of the flowerpot resulted in a lovely swirl that we were both pleased with. We wiped the bottoms of all of our painted pieces to remove excess nail polish and put them in the sun to finish drying. Since the terracotta absorbed water, we waited until everything was dry and moisture had evaporated from the clay. Cassidy seals the containers inside and out with a clear matte finish, but that is personal preference. That step isn't necessary, but we do advise it, especially if you plan to use your pot outdoors. Her purple and green pot is headed home with her and she plants a marble pothos in mine. We were very pleased with this Frugal Gardener project and are anxious to do some more before she heads back to school in the fall. This project is an excellent way of making all of those mis-matched containers laying around co-ordinated and relevant again. It takes very little money to make it look like you spent hundreds of dollars on fancy pots. I think we paid less than a dollar for any of the nail polish we used. The cheaper, the better!